Violet is a full-time stay-at-home mom of two, who also likes to ‘cake’ on the side. 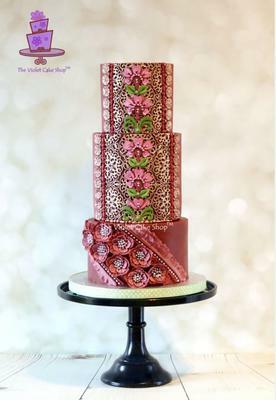 She has been creating creative custom cakes for over a decade, is self-taught and has become known and recognized for her unique designs and distinctive use of bold colours and textures. Her work has been featured in numerous magazines internationally, most recently on the cover of Cake Decoration & Sugarcraft (UK) April 2018 issue. As a sugar art instructor and Satin Ice Artist of Excellence, she teaches her unique style in demos, hands-on classes and magazine tutorials, as well as in online video classes with Craftsy (US) and Pretty Witty Cakes (UK). Brief history of her business and how she got to where she is today. I spent over 3 years creating custom cakes for friends and family until I got pregnant with my daughter in 2012. I had to take it easy as I experienced some high risk issues in my pregnancy, so I went on hiatus with every intention to start up again after she was born. Once she was born, I was able to make a few cakes for personal occasions where I had complete free reign on design - and that is when I discovered that I really enjoyed the designing side of decorating the most. Plans changed after I started concentrating more on cakes for personal occasions and projects and took only occasional orders. I found I was much happier and also started getting more recognition for my work because I was able to do ‘my own thing’. 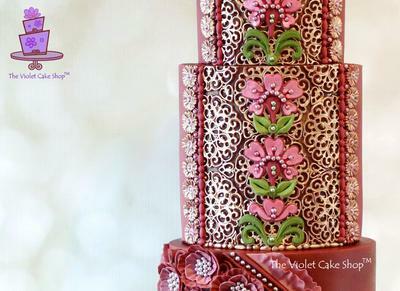 Soon after, I was being invited to film online classes for Pretty Witty Cakes in the UK and Craftsy in the US. Then I was invited to become an Artist of Excellence and started getting requests to teach. Unfortunately I am not able to travel much to teach at the moment due to my kids and my husband’s business, but I would love to start doing that soon. Q. If you weren't decorating cakes, what would you be doing? A. I would probably be doing something in fashion or interior design as both involve creativity and the use of color. Q. What is a 'regular' cake decorating day like for you? A. A typical decorating day can vary significantly for me because I do most of my work from home - so the schedule has to adapt around my kids’ needs, which always vary. But one thing that does remain fairly constant is the need for at least one all-nighter in the mix because I tend to underestimate the amount of time certain things will take and am crunched for time in the end. This is more likely to happen when it’s an actual cake order versus a project where I can use cake dummies. I never like to bake too far ahead and I never freeze my cakes - so, because of this I have less time to work on the actual finish or dressing of the cake than some people who do freeze their cakes. Q. What is your creative process for making cakes? A. I normally will start with the theme or inspiration piece for the occasion to form a general idea - then take into account how big the cake needs to be or how many it needs to serve to determine the number of tiers or dimensions needed. Next, I will consider what elements are to be included, whether it's a topper or a sugar floral arrangement or figures, and what colors I want to use if the client does not specify. I will visualize the general design with all the elements that are to be included first, with several alternative options, then narrow it down to my final choice and sketch that. During this stage, I think about where elements will look best, if there is balance and interest in the design, as well as if there is textural and visual contrast. Sometimes I am torn and may have to sketch more than one idea in order to make a final decision. My sketches are rarely ever colored in, so I can visualize other color combinations, if necessary. Once a final design is decided, I will determine what techniques are needed to execute each of the design elements and plan out my time line from there based on what needs to be done when - as some pieces need longer drying time, etc. Q. What is your favorite part about making/designing cakes? A. My favorite part is coming up with the design, followed by seeing the vision come to life when you’re in the later stages of decorating. Q. What do you aspire to accomplish with each cake? A. Mostly, I just try to create designs that are true to my own esthetics. I am not one to create designs that go with the flow just so they’re accepted. I would like to inspire others with my designs and maybe get others to think outside the box about what they can do creatively or what is considered pretty or attractive. If they can see that I’m not afraid to be ‘out there’ and try unexpected combinations with my designs, be it with bold color combos or mix of textures, then maybe they’d be more willing to try something new too. Q. What is the next "big thing" for you? A. My next big thing would be to do some live classes. I have been asked many times to teach abroad but have declined most of them so far. My daughter will be in school soon and once both my kids are older and less dependent on me, I will be able to spend more time away from home. It would be a great experience for me if I could travel and teach. I also would love to be able to enter a competition at a cake show one day and am currently considering going to Cake International in 2017. I was inspired by the intricate and ornate designs in Pakistani fashion, with their deep, rich colours and beautiful patterns and detailing. I created something inspired by a few pieces I saw, blending elements from different outfits into my design. I chose to use burgundy as my base colour because it features prominently in a lot of the fashion pieces I saw. I also noticed that gold is used a lot and a popular accent in Pakistani fashion as it conveys luxury as well as refinement. I hope I captured the essence of how spectacular Pakistan’s fashion really is.